The Global Volcanism Program has no activity reports for Bárcena. The Global Volcanism Program has no Weekly Reports available for Bárcena. The Global Volcanism Program has no Bulletin Reports available for Bárcena. 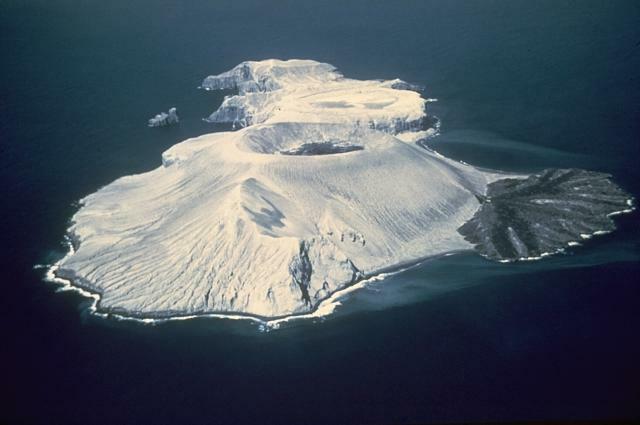 Volcán Bárcena, formed by eruptions during 1952-53, is the most prominent feature of Isla San Benedicto, the NE-most of the Revillagigedo Islands, 350 km south of the tip of Baja California. San Benedicto island, elongated in a NE-SW direction, contains a series of Pleistocene trachytic lava domes at the north end. 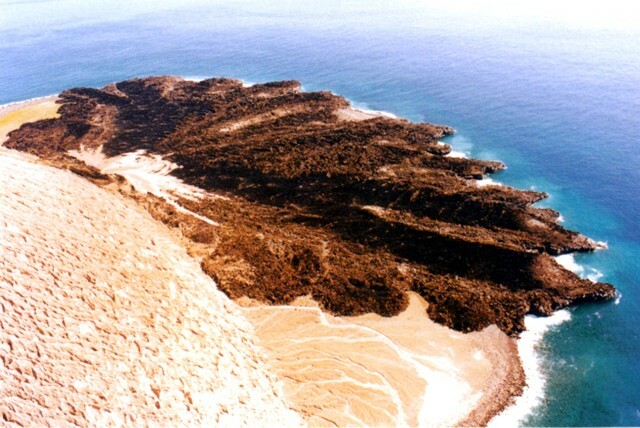 The southern end of the 4.5-km-long island is formed by Bárcena and Montículo Cinerítico, a smaller tephra cone that preceded and was largely overtopped by Bárcena. Montículo Cinerítico may also have been constructed during the past few hundred years and formed the high point of the island prior to the formation of Bárcena. Growth of the 300-m-high Bárcena tephra cone beginning in August 1952 was accompanied by strong explosive eruptions and pyroclastic flows. The eruption concluded the following year with the emplacement of two small lava domes in the crater and extrusion of a prominent coastal lava delta at the SE base of the cone. This volcano is located within the Archipiélago de Revillagigedo, a UNESCO World Heritage property. Richards A F, 1959. Geology of the Islas Revillagigedo, Mexico 1. Birth and development of Volcan Barcena, Isla San Benedicto. Bull Volcanol, 22: 73-124. Richards A F, 1966. Geology of the Islas Revillagigedo, Mexico, 2. Geology and petrography of Isla San Benedicto. Proc Calif Acad Sci, 33: 361-414. Richards A F, 1965. Geology of the Islas Revillagigedo, 3. 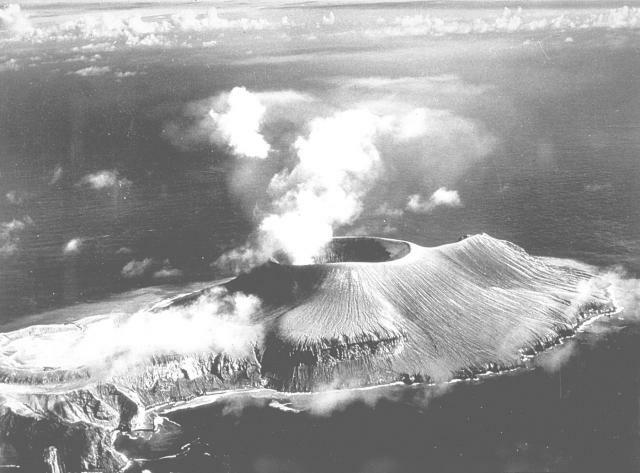 Effects of erosion on Isla San Benedicto 1952-61 following the birth of Volcan Barcena. Bull Volcanol, 28: 381-403. There is no Deformation History data available for Bárcena. There is no Emissions History data available for Bárcena. 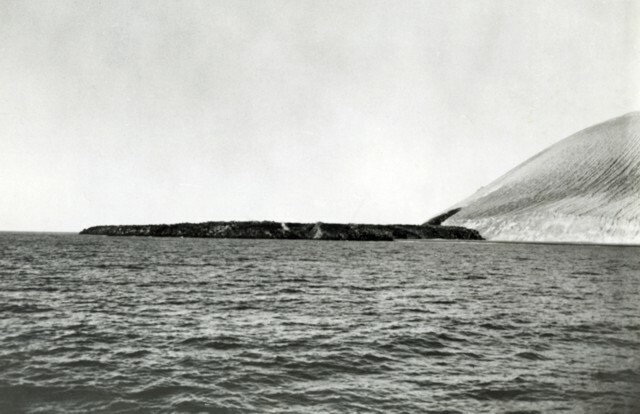 Bárcena volcano forms the elongated island of San Benedicto, seen here from the SW in March 1955. 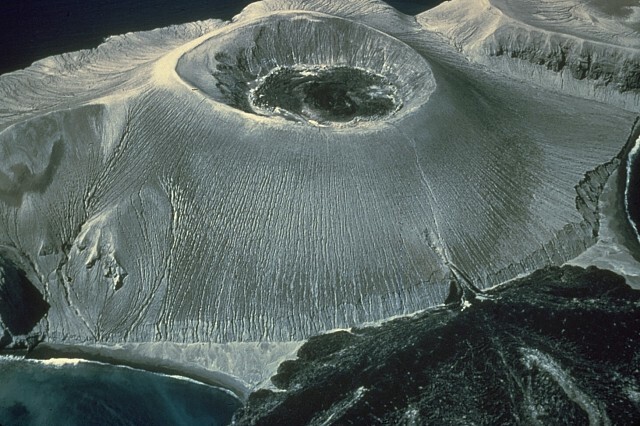 The tuff cone with the circular summit crater at the center and the lava delta to the right were formed during an eruption in 1952-53, the only eruption known from this volcano in historical time. Pleistocene trachytic lava domes are located at the far NE tip of the island. Dark-colored lava domes from the 1952-53 eruption can be seen in the summit crater. Photo by Adrian Richards, 1955 (U.S. Navy Hydrographic Office). A steaming lava flow issuing from a fissure on the SE flank of Bárcena volcano, in the Revillagigedo Islands west of México, forms a peninsula about 300 m wide that extends about 230 m out to sea. This photo from the SE on December 11, 1952 was taken only 3 days after the beginning of lava effusion. By the time the eruption ended in February 1953 the lava delta had extended the shoreline by 700 m.
Photo by Adrian Richards, 1952 (U.S. Navy Hydrographic Office). An aerial view from the west shows the new steaming summit crater of Volcán Bárcena. The crater truncates a 700-m-wide tuff cone that had grown to a height of about 380 m in the first two weeks of the eruption. 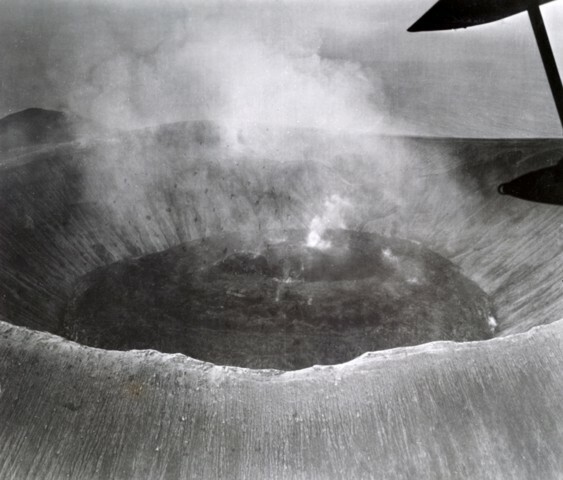 At the time of this September 20, 1952 photo, taken about 7 weeks after the start of the eruption, the first of two lava domes had emerged in the summit crater. Extrusion of a lava flow that formed a delta on the far SE side of the island had not yet begun. Photo by U.S. Navy, 1952 (courtesy of Sherman Neuschel, U.S. Geological Survey). 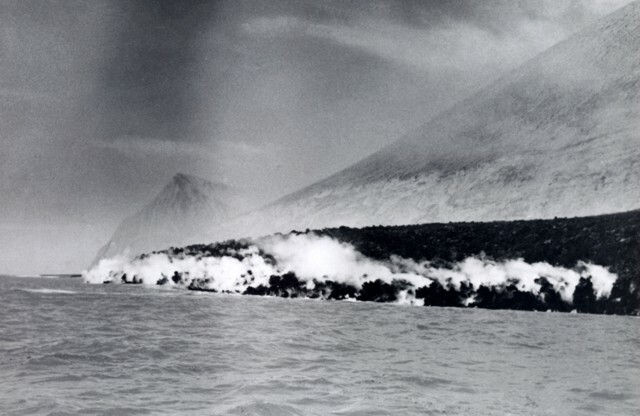 Pyroclastic surges sweep out to sea at the western coast of the island at about 0805 hrs on August 1, 1952, about 20 minutes after the start of the eruption. 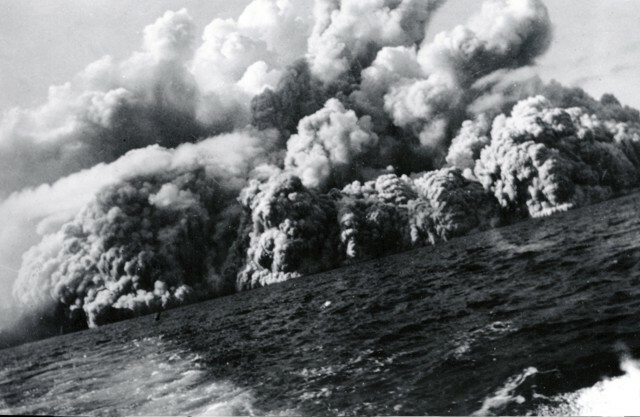 Several inches of ash and scoriae up to 12 mm in diameter fell on the deck of the fishing boat from which this photo was taken as it sailed away from the volcano at full speed. All but the northern end of the island was obscured by the eruption column. Photo by Robert Petrie, 1952 (U.S. Navy; courtesy of Sherman Neuschel, U.S. Geological Survey). A weak ash-laden vulcanian eruption plume rises from the crater on September 9, 1952, more than a month after the start of the eruption. The roughly 300-m-wide crater is seen here from the east. 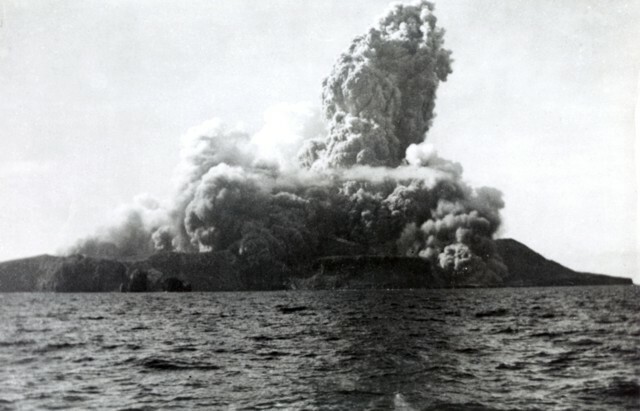 Explosions producing eruption columns that rose to about 600 m above sea level were observed at 20-minute intervals, along with occasional small pyroclastic surges that swept down the flanks of the cone and sometimes reached the coast. The roar of the eruption was heard above the noise of the plane's engine. 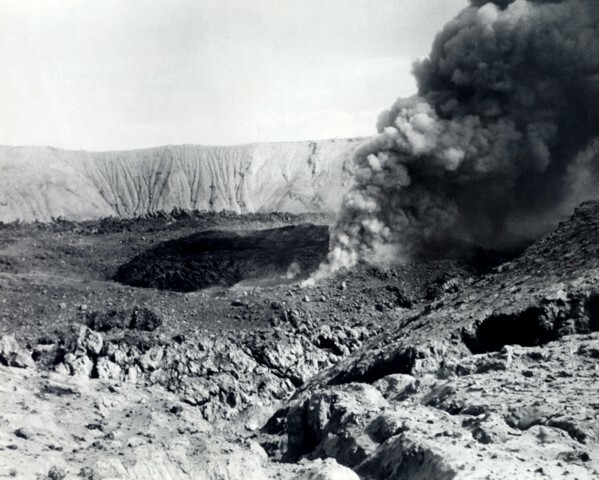 A small steam-and-ash eruption on December 10, 1952 took place from the moat between the inner (dark-colored) and outer lava domes in the summit crater of Bárcena. A lava dome was first observed on September 20, when it was about 8 m high and 55 m wide. On November 15 the dome was observed to fill about half of the 700-m-wide crater. At the time of this photo, an older outer dome littered with breadcrust bombs and ejecta surrounded the freshly extruded inner dome. Photo by L.W. Walker, 1952 (courtesy of Sherman Neuschel, U.S. Geological Survey). An overflight on November 15, 1952 shows the crater half filled with viscous trachytic lava. 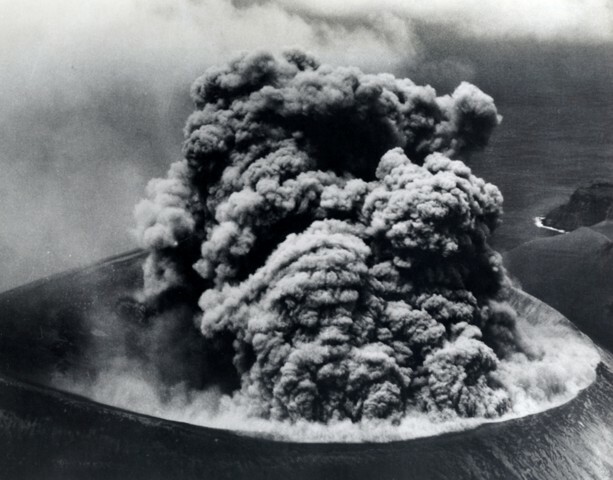 Sporadic small steam-and-ash explosions were observed during the overflight, and continuous weak steam emission took place from the center of the dome. Montículo Cinerítico in the left background at the southern tip of the island is an eroded pyroclastic cone that preceded the 1952 eruption. A new pyroclastic cone, Volcán Bárcena, was rapidly constructed during explosive eruptions beginning August 1, 1952 at the south end of Isla San Benedicto. 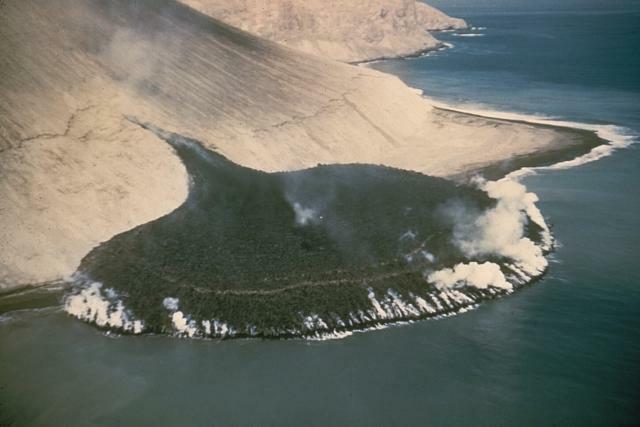 This photo was taken from off the west coast of the island only four minutes after the start of the eruption and also shows the onset of pyroclastic surges. Lava dome extrusion occurred in September, November, and December. On December 8 lava effusion began from a vent on the SE flank, producing a lava delta that extended about 700 m to sea. Activity ended in late February. The dramatic lava delta formed during the 1952-53 eruption is seen from the NE. The Delta Lávico flow extended 700 m out to sea on the SE side of Isla San Benedicto and formed a peninsula about 1200 m wide. A thin tongue of lava can be seen at the right originating from the vent on the lower SE flank. The SE-flank eruption began on December 8, and by the following morning the trachytic lava flow reached the coast. Lava effusion continued until January and February. Entry of the Delta Lávico flow into the sea produces steam clouds along the margins of the flow. The flow originated from a vent low on the Volcán Bárcena 1952-53 tuff cone visible behind the flow. 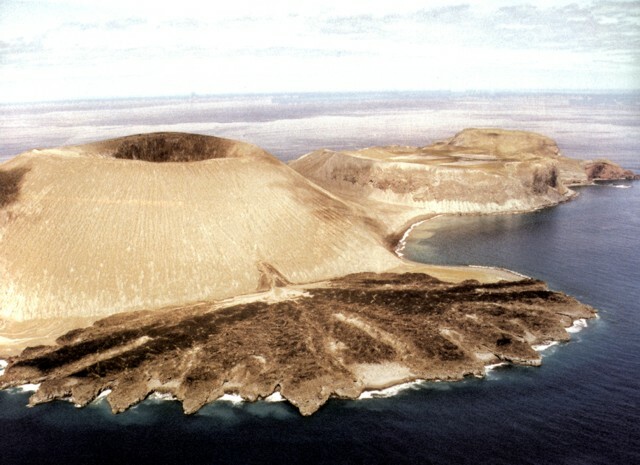 Punta Sur, the southernmost tip of the island, is in the left background and consists of a truncated portion of the trachytic Montículo Cinerítico tuff cone, which formed prior to the 1952 eruption and was formerly the highest point on the island. Wave erosion rapidly modified the once smooth coastal margin of the lava delta erupted in 1952-53. The vent for the flow lies at the upper left at the base of the light-colored tuff cone also formed during the eruption. The Delta Lávico flow extended 700 m out to sea and formed a peninsula about 1200 m wide. Photo by Hugo Delgado-Granados, 1993 (Universidad Nacional Autónoma de México). The dramatic Delta Lávico flow forms a peninsula on the SE flank of Volcán Bárcena at the southern end of San Benedicto Island. The tuff cone and lava flow were formed during the 1952-53 eruption. The Bárcena tuff cone now marks the high point of the island. The flat-topped cone at the right is Cráter Herrera, a trachytic lava dome capped by a smooth-floored crater. Another lava dome, Roca Challenger, forms the northern tip of the island beyond Cráter Herrera. The following 42 samples associated with this volcano can be found in the Smithsonian's NMNH Department of Mineral Sciences collections, and may be availble for research (contact the Rock and Ore Collections Manager). Catalog number links will open a window with more information. Large Eruptions of Bárcena Information about large Quaternary eruptions (VEI >= 4) is cataloged in the Large Magnitude Explosive Volcanic Eruptions (LaMEVE) database of the Volcano Global Risk Identification and Analysis Project (VOGRIPA).